Japanese ambient music grew out of the 1980s “economic miracle” that saw the country undergo massive urban development and industrial expansion, with Tokyo emerging as a global financial and cultural mecca. Hiroshi Yoshimura, a sound designer by trade and a musician since age five, was the defining figure of a close-kept movement he and fellow ambient pioneer Satoshi Ashikawa called “environmental music” or “wave motion,” the idea that sound can and should be treated as an “object” that “changes the character and meaning of space, things and people.” Though the resulting recordings were something of a reaction against the relentless bustle of Japan’s commercial and technological transformation, they were also largely dependent on it. Yoshimura’s first LP, Music for Nine Postcards (1982), consists of nine tracks designed to be played in specific locations within the Hara Museum of Contemporary Art (converted in 1979 from a private mansion). The album is a brilliant incarnation of his musical philosophy: the pairing of two or three repetitive, complimentary wisps of music, usually a brief but vivid melody over a murmuring chord, the space between the notes just as pronounced as the notes. 1983’s Pier & Loft was composed for a Tokyo fashion exhibition and is the most “upbeat” Yoshimura would ever get. A・I・R (Air in Resort), released in 1984, was commissioned by a Japanese cosmetics company and given away with a forest-themed perfume (the green LP sleeve was sealed, the scent released when opened). 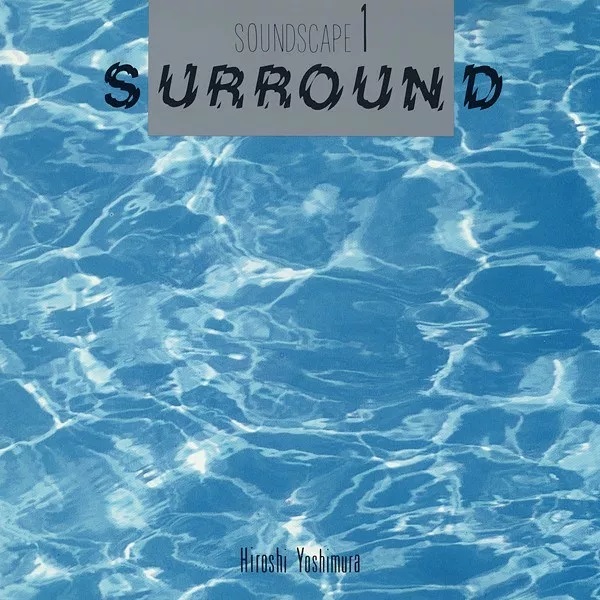 Both Green, generally considered his masterpiece, and Soundscape 1: Surround, which I would argue is just as good, if not better, came out in 1986. The latter was produced by Misawa Home, a top competitor in the prefabricated housing market, and meant to be played by the owners in their new, decidedly modern, homes. Again, Yoshimura was attempting to use music as any other design element at work within the space, be it layout or decor or color or lighting. Where Green is organic and nostalgic, incorporating natural sounds (birdsong, waves) and elements of traditional Japanese music, there is something foreboding, even forlorn, about the glistening Soundscape 1: Surround, as if the price for the sun-spangled swimming pool depicted on the LP cover, a quintessentially American symbol of luxury and freedom that was non-existent in Japanese homes, is too high. Traditional Japanese architecture, after all, points the mind to empty space, stillness, the paper screens and paneless windows and water gardens provoking communion with the outside world—a perfect analogy for Yoshimura’s music. The Western edifice, on the other hand, from medieval cathedral to gated suburb, is designed to fill with things, and to keep nature and the barbarian hordes at bay. In ’80s Japan, only a few decades removed from the depredations of war and atomic conflagration, these two worlds crossed swords: hundreds of thousands of urban, mostly young Japanese aspired to that Western way of life; in fact, Japanese artists and illustrators of the era like Eizin Suzuki and Hiroshi Nagai, as well as the breezy music of City Pop, did just as much to invent—and venerate—the mythic image of pastel-tinged American beach life than anyone from Los Angeles or Miami. In a catalog defined by its uniquely committed minimalism, Yoshimura’s Soundscape 1: Surround aches with anticipation. A child with a year’s worth of piano lessons could play these bright, descending notes, or this series of sound droplets, or this quietly suspenseful progression drenched in vibrato—but only an accomplished anxiety could pair it with the doleful drone that murmurs under everything, sounding at one point like the static of a dead TV screen. All of the album’s tracks reference water and time and nature, evoking a sensation, both deeply comforting and deeply sad, of endless submersion and endless recurrence, of a world that is always irrevocably changing. It is almost indescribably poignant. The paradox of ambient music is that some of it, the best of it, is too beautiful “to be listened to casually” or “peripherally,” as Yoshimura intended. “Sound scenery,” he maintained, should not “excite the listener into another world,” but “drift like smoke and become part of the environment.” It was not art, he said. And yet what else can it be, this music that “changes the character and meaning of space, things and people”? Like all great creations, it travels through time, endures through generations, defying its very creator, defying its corporate sponsors. It is movement and a feeling that cannot be bound by any particular space or direction. It meets us wherever we are.